Many of you have been asking about Tim’s mission patches. Carl Walker, ESA Bulletin editor and curator of the ESA History web pages, looks at the various patches worn by ESA astronauts and gives details for space patch collectors. Along with the ESA ‘flags’ shoulder patch and their national flags, all ESA astronauts wear an ESA mission patch and a flight patch on their blue flight suits. Until 2011, the flight patch could have been a NASA Shuttle mission patch, but nowadays these are Soyuz flight patches. If they are assigned to a long-duration mission on the International Space Station, their flights will normally overlap two Expeditions, hence they are given two more patches. 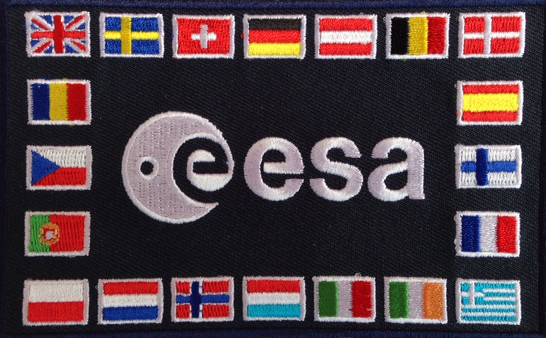 The ESA flags patch has evolved over the years, gradually increasing in number of flags as the Agency grows in Member States. Today it has 22 flags. It used to be worn on the right shoulder of the astronauts’ flight suits, but has now moved to the right chest position (it can still be seen on the right arms of our astronauts’ cold-weather jackets). This patch is also worn on the Sokol spacesuits, with Russian patch convention putting it on the lower left front of the suit. In some pictures, you will see astronauts still wearing 20-flag patches or even older 18-flag ones. This is often because the newer patches have not been ready in time for adding to spacesuits, which are prepared months before launch, or for including in personal kit that is sent into space long before the astronaut arrives on the Station. 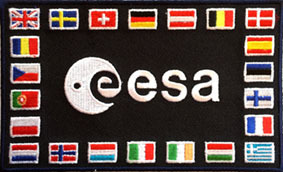 ESA mission patches are sometimes chosen in competitions held in the astronauts’ home countries. This was the case for Tim’s Principia patch. This mission name was chosen after more than 4000 people replied to the call for a mission name in 2014. The name refers to Isaac Newton’s world-changing text describing the principal laws of motion and gravity. 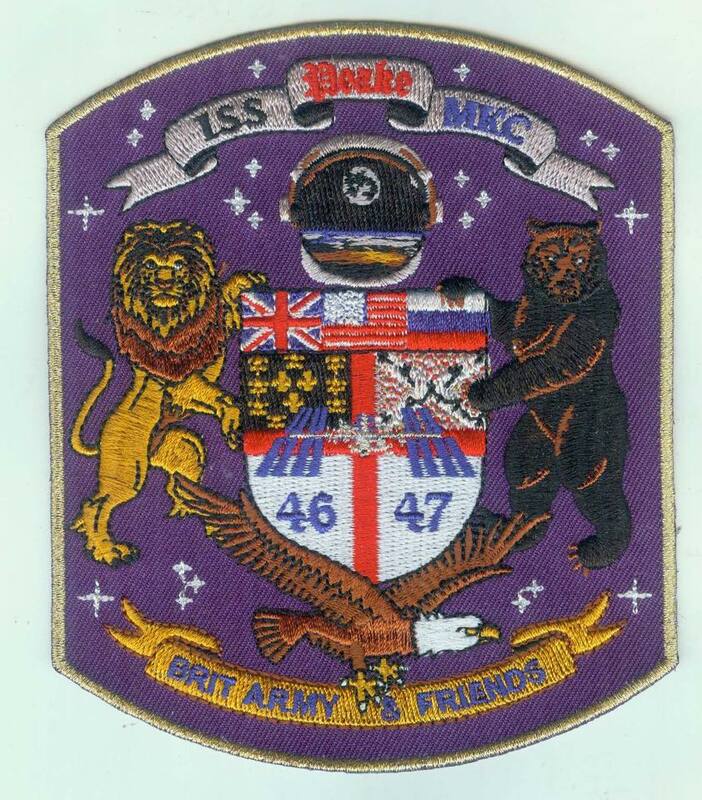 The patch design was then chosen in a nationwide competition organised by the BBC’s Blue Peter TV programme, which asked schoolchildren to design a mission logo. Out of more than 3000 entries, the winning design was by 13-year-old Troy Wood. The Principia design features the mission name and an apple, which represents Newton’s laws of gravity. Note a small ISS symbol represented in the light reflecting off the shiny apple skin. Tim’s Soyuz rocket is depicted at launch and the United Kingdom is visible on Earth below. A gold orbit completes the design with the colours of the Union Flag running around the border. Tim flew to the International Space Station in the Soyuz TMA-19M spacecraft as part of Expedition 46/47, with cosmonaut Yuri Malenchenko and NASA astronaut Tim Kopra. 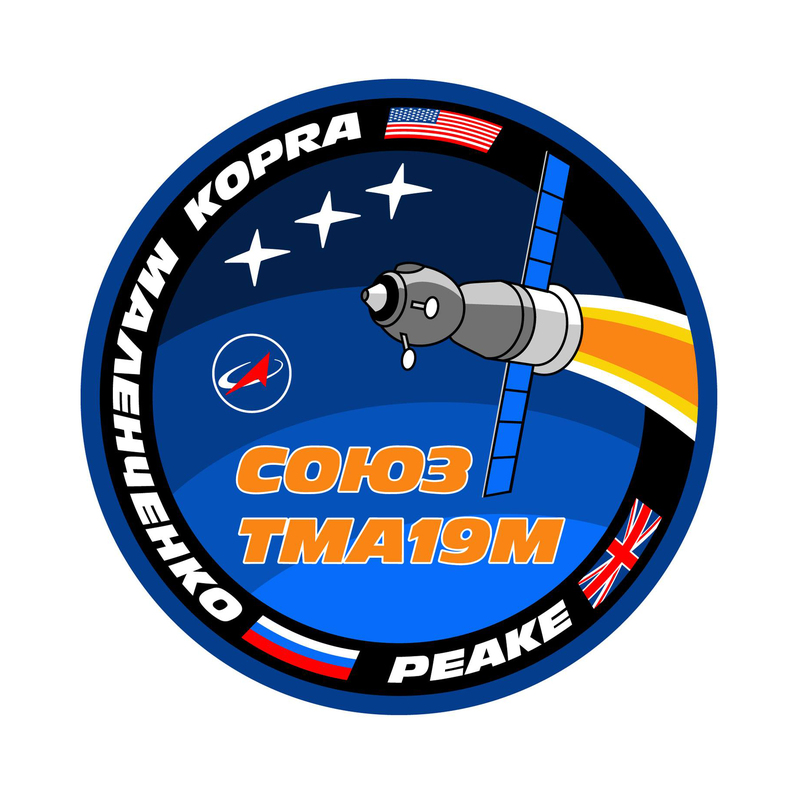 The Soyuz TMA-19M flight patch was created for Roscosmos by designer Luc van den Abeelen with the crew. This simple design shows a Soyuz reaching orbit over four shades of blue representing Earth’s land, seas and atmosphere and space, three stars represent the crew, and each crewmember’s name is accompanied by their national flag. 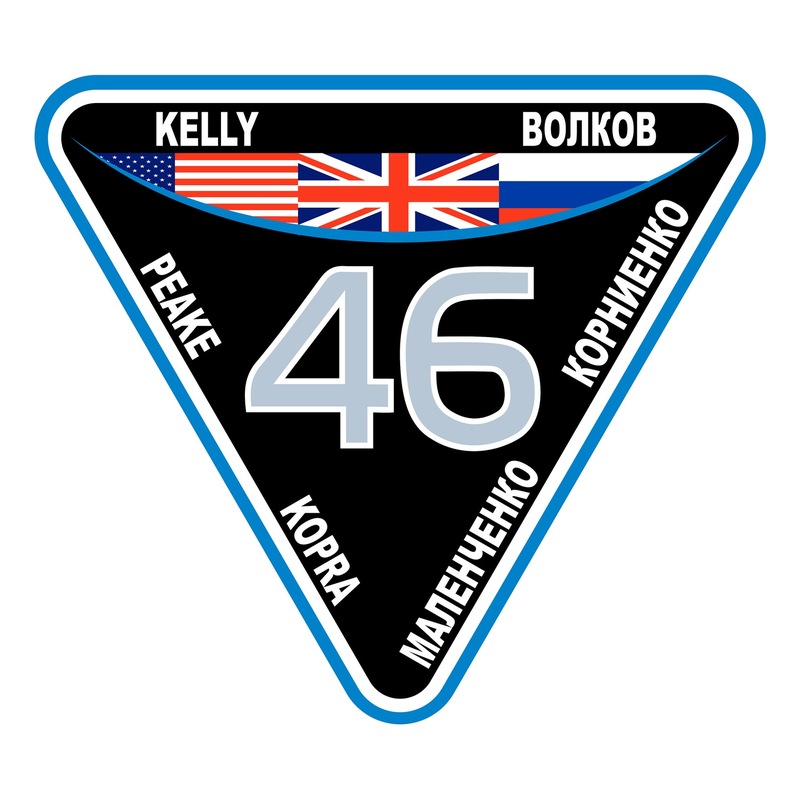 The Expedition 46 patch has a bold 46 in the foreground. Earth is depicted at the top with the flags of the countries of origin of the crewmembers: USA, Russia and the UK. The Union flag of the UK is displayed in a position of prominence in recognition of the significance of the first British ESA astronaut to fly in space. The names of the six Expedition 46 astronauts and cosmonauts are included. 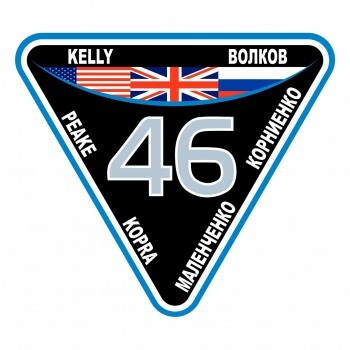 Tim, Yuri Malenchenko and Tim Kopra will transfer from Expedition 46 to Expedition 47, when they will be joined by cosmonauts Alexei Ovinchin and Oleg Skripochka and NASA astronaut Jeffrey Williams. The design for Expedition 47 was created by artists Tim Gagnon, USA, and Jorge Cartes from Spain. Based on a stylised Sokol spacesuit helmet visor, it shows view of the Station seen by the crew as they approach in their Soyuz. And finally, of course, there are some more unusual patches up there with Tim: the limited edition #Spacerocks patches, prizes for his Twitter-based music competition. 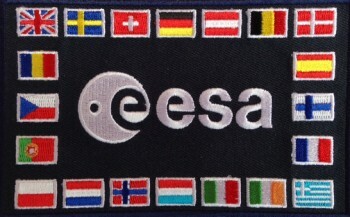 These patches were specially designed by R. Sandri of Italy and produced for ESA by Lucreation, Netherlands. They show an electric guitar, bearing a Union flag, with its lead originating from the International Space Station. 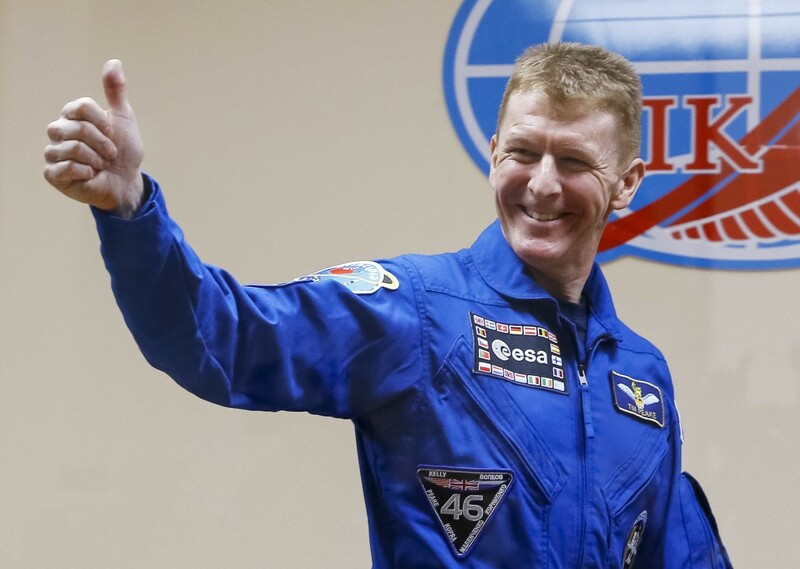 The ten stars are grouped in a four and a six, representing Tim’s membership of Expedition 46. 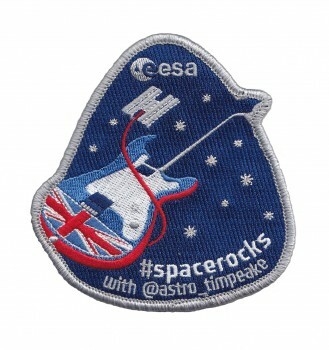 It bears the ESA logo and the hashtag #spacerocks with Tim’s Twitter name @astro_timpeake. 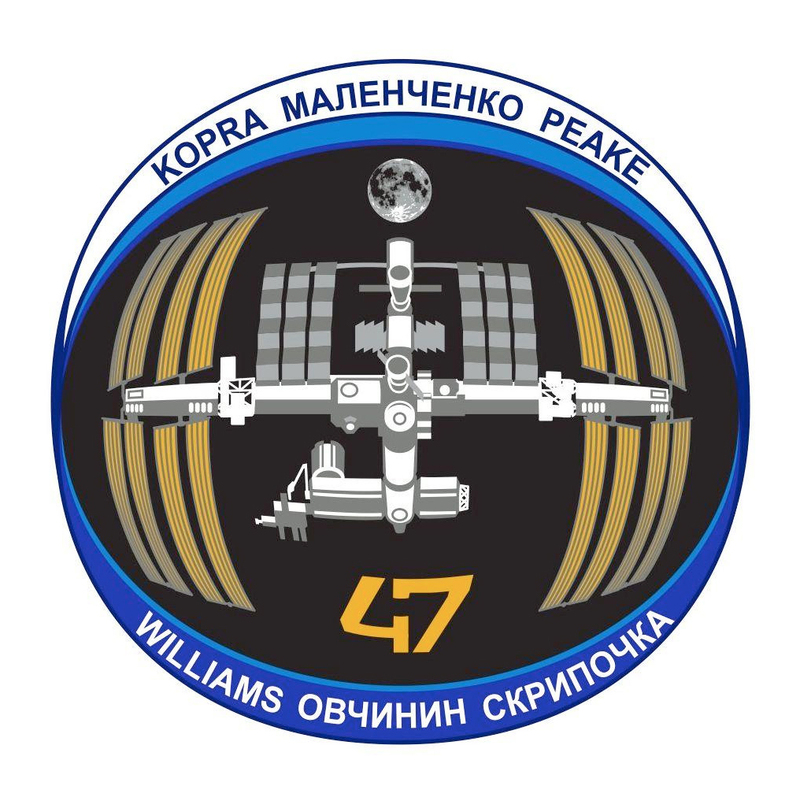 *Note: Expedition 47 will be released just before the actual Expedition starts, i.e. March 2016. Thank you for including my commemorative Peake Coat of Arms patch. What is the patch Tim is wearing on the EVA today? I can see the flag on his right arm but what is on his left? To me it looks like the one that Michael López-Alegría wears in the image on the BBC website? is it the Principia patch? That patch is the spacesuit’s own patch to represent the people that built the spacesuit and work on spacewalks. Tim’s #spacerocks competition is great fun but is now being spoiled and abused by the suspiciously-new Twitter accounts being set up to enter! They are replying with identical tweets within milliseconds of Tim’s tweet. Some even say they are automated responses! I hope you are noticing these accounts?